Price is per single 500mm length (2x 500mm lengths = 1 meter). Minimum order quantity: 20x 500mm lengths (=10 meters). Bulk order discounts are available. Please contact us for latest pricing, sample packs and selection advice. E-Spike® 140 are the ideal DIY bird spikes for bird proofing roofs, houses, farm sheds, garages and other buildings indoors and outdoors. Stainless-steel prongs with flexible polycarbonate base are a effective and very affordable solution. The flexibility of the spikes allows mounting on flat or curved surfaces. 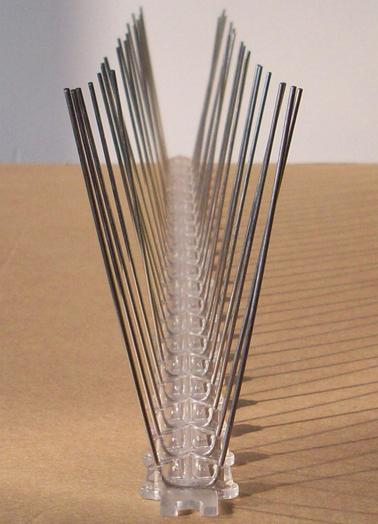 E-Spikes are easily self-installed using adhesive, nails, screws or wire ties. Birds instinctively fly to "landing strips" such as roof ledges, window sills, building projections, signs, statues, trusses and beams. Bird spikes are the most effective "keep off" sign you can post. 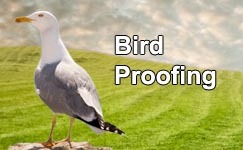 Prevent Pigeons from landing, roosting and nesting. Stop unsightly bird droppings and eliminate cleaning and building maintenance costs. E-Spikes are easy to install & maintain. 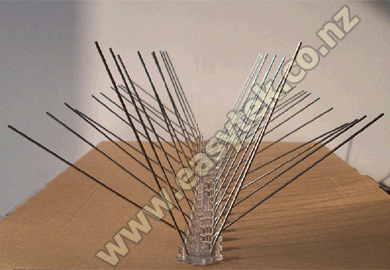 Stainless-steel bird spikes with polycarbonate base attach to most surfaces using nails, screws, adhesive, wire ties, etc. Use SBS45 and SBS90 premium-grade spikes for tough environments such as marinas, bridges and all coastal areas. FLEXIBLE polycarbonate base with stainless steel prongues. EASY INSTALLATION using nails, rivets, screws or bird spikes adhesive. USE ANYWHERE, indoors and outdoors. Pests: Medium to large birds (e.g. Pigeons, Magpies) and climbing animals such as Possums, Cats etc. Uses: Use on roof tops, ridges, edges, beams, rafters, railings, air conditioners, signs, windowsills, gutters, roof perimeters, chimneys, support structures, fences, awnings, poles, lights, statues, trusses, building projections and anywhere else where birds roost. Not suitable for coastal areas. E-Spike® 140, 500mm lengths reviewed by CHERYL C., MANUKAU CITY on 2016-10-21 . E-Spike® 140, 500mm lengths reviewed by CHERYL C., MANUKAU CITY on 2016-10-05 .